Today's post might be a Southern Belle in Training first! I'm bringing back old blog content, I think the technical term is "repurposing." I've seen other bloggers do this time and time again with their most popular posts, and I'm all about trying new things, so I figured it's time I finally give this a try in 2018! One of my most popular blog posts of all time was one that I wrote in December 2016, entitled "How I Saved Almost $1,400 in 2016." As I wrote in that post, at the time that was one of the only New Year's resolutions in my life that I'd ever successfully kept! I'm doing the same savings plan again for 2018, so I thought I would revisit this popular blog post again, because at only 10 days into January it's not too late to add on another resolution for the year, especially one that's so easy and financially beneficial! To recap: in December 2015 (when I was a senior in college), I knew that my savings account needed some work. In order to keep more money in my checking account, I had kept pulling money out of my savings for "fun" expenses during fall semester of my senior year, like weekend trips, nights out, sorority expenses, etc. Nothing that qualified as an emergency expense or a good reason to pull money out of savings. I knew I need to start revaluing the difference between my checking and savings accounts, and starting building my savings again. I wanted to find a savings plan that I could complete in 2016. My goal was to have at minimum $1,000 in savings by the end of the year, but hopefully more. I was so excited when I found the 52-Week Savings plan! I decided to complete it in 2016, and can tell y'all now that I was SUCCESSFUL that year in doing so! 😊 I was seriously so excited when I wrote my first blog post about this savings plan in 2016- prior to this, I had never had much luck with completing a New Year's resolution! It is the easiest thing in the world to do if you commit to it- are you ready for this? You transfer the dollar amount from your checking to your savings account that matches up to the week of the year that it is, and do this every week for 52 weeks. So last week, the first week in January, transfer $1! This week is the second week of the year, so it's $2. The first week in March is the 10th week of the year, so $10 goes into savings. And so on and so forth. Amounts do get higher as the year goes on, and they're highest in November and December, as those are later weeks of the year. (That is something to be aware of and prepare for, as holiday expenses need to be factored into a budget during the end of the year, but you don't want to lose sight of the savings plan either.) Trust me though- you will feel AMAZING when you deposit that $52 and complete the plan during the last week of December. All in all, if you complete the plan for all 52 weeks, you'll have $1,378 in your savings account at the end of the year. WOW! That's a whole emergency savings account right there. If you already do have money in savings, you can still do this plan and could use the money to make a significant payment on your student loans, or put it towards an amazing vacation for the following year. If you think you're not able to commit to doing this- let me convince you otherwise! I was a full-time student with minimal income from babysitting and blogging during the year that I did this, and I was still able to complete it. This year I'm excited to tackle it with both my primary bank account (where my job paychecks go) and also my blogging bank account. Double the savings, double the benefits at the end of the year! When I did this savings plan the first time in 2016 I was still regularly using a Lilly Pulitzer agenda for school, so I went through at the start of the year and wrote down how much I'd be depositing into savings on each Monday, so that I wouldn't forget to do it! Now I use iCal on my phone and computer to manage my life instead of an agenda, so I went through and already set deposit reminders for every week for the next few months. Be sure to either write down or set electronic deposit reminders- whatever works best for you! Last week's deposit amount was only $1, so it's not too late if you still want to join me in this challenge!! You would simply make a $3 deposit this week. I promise you won't regret doing this... your savings account will thank you, and at the end of the year you'll have a lot of financial peace of mind! To check out the original blog post that I wrote about doing this- click here! Become more educated about personal finance is a goal of mine for this year and next. The first book that I'm reading in 2018 is actually about financial literacy for millennials and so far I'm loving it! Please let me know if you'd like to see more blog posts/content on these topics as I continue to educate myself!! This is such a great idea for a savings plan! I am trying to save more as one of my resolutions as well, so I love this idea and how simple you made it. I'd LOVE to see more personal finance content! I'm definitely trying to save more this year so I might try this plan! I've tried the 52 weeks saving challenge before but I've miserably failed. I thought about starting from the highest amount as there is no way I can save in December (I love to buy too many chirstmas presents). GET IT GIRL! I love that you're focusing on your finance this year! Seriously the younger you can get it and develop a strong relationship with money, the more it continues to reward you in life! Let me know if you have any questions or need any tips! Definitely a creative way to save money! You could always reverse it so you put $52 into savings the first week. That way when the holidays come it's not as taxing. Just a thought! This was the same way I saved up for our backpacking trip a few years ago! It's such an easy way to save money! 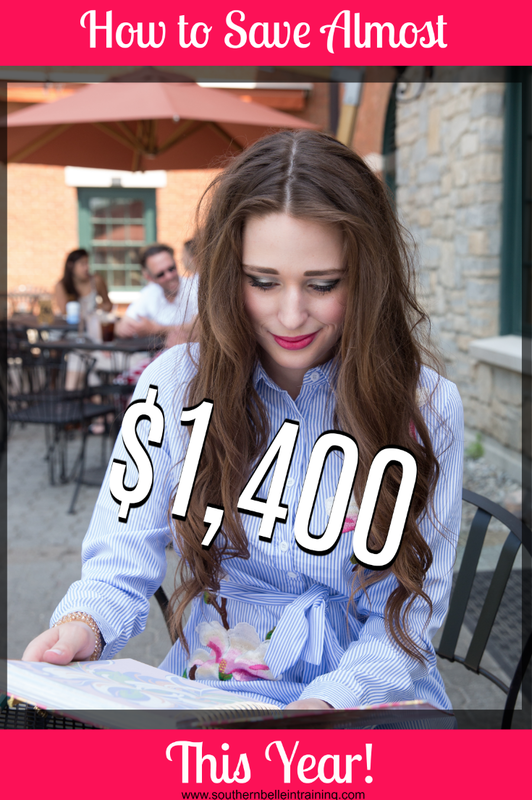 I've heard about this strategy before, and I'm always amazed that it adds up to $1,400! I've also heard that you can start backwards ($52 the first week) so that you deposit less in December when you would have more expenses! I love this idea!! It makes saving seem so much less daunting! Oooh love this idea, I definitely need to try it! That's awesome! Definitely do this after you max out your 401k contributions! This year I have SO many extra expenses. This savings plan is such a good way to keep my savings goals in check.